The winning teacher will receive $5,000 for their school and a trip to Barcelona to attend EF’s Global Student Leaders Summit. The four runners-up will each win $1,000 for their school. Plus, we’ll enter you into a draw to win a MacBook Air® just for nominating a teacher. The winning teacher will receive the 2014 Teachers Matter Award—$5,000 for their school and a trip to Barcelona to attend EF’s Global Student Leaders Summit. The four runners-up will each win $1,000 for their school. Plus, we’ll enter you into a draw to win a MacBook Air® just for nominating that teacher. MacBook Air® is a registered trademark of Apple Inc. Apple is not a participant or sponsor of this promotion. For full contest rules and prizes click here. 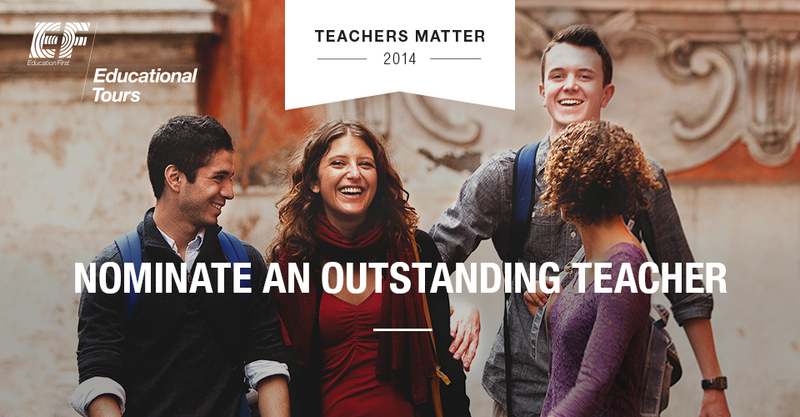 The deadline for nominations for Teachers Matter 2014 has passed. Please check our Facebook page on November 17 to view the top 10 finalists and vote for who you would like to win!